A.W.N. Pugin, the designer of this cabinet, called it an 'armoire' after French Medieval cupboards, which he admired. Originally the central section was intended to hold shelves for books. A.W.N. Pugin (1812-1852) and J.G. Crace (1809-1889) collaborated on many successful furniture projects. These included not only the Palace of Westminster but also several country houses. Pugin suggested the details painted on the shields on the top of the cabinet. They include Crace's initials, a plummet (a carpenter's tool) as an emblem of his honesty, and a compass to indicate his ability to keep within his estimates. 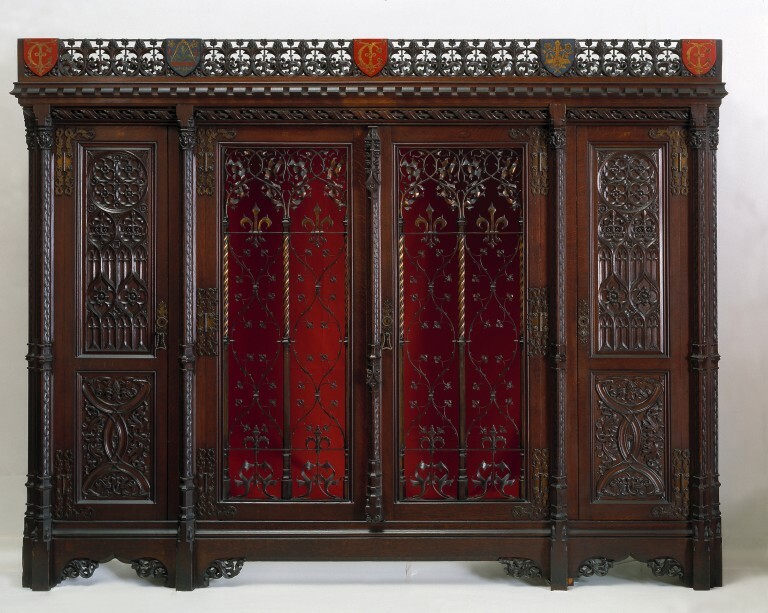 The cabinet was the grandest piece in the group of furniture designed by Pugin and made by Crace for the Medieval Court in the Great Exhibition of 1851. As Crace was a judge for Class XXVI (Furniture) and the cabinet was exhibited in his name, it was not eligible for a medal. The cabinet is made of oak with elaborately carved panels and brass screens, the openwork cornice decorated with painted shields. The front of the cabinet is divided into three sections by pilasters; the two outside sections narrow, the middle section wide. The pilasters have plain square section bases connected by aprons. The side aprons are ogival with carved foliate brackets at the sides of the ogee. The longer central apron has similar carved brackets but is straight in the centre with no ogival shaping. Above this stage the pilasters are complexly moulded and of a semi-octagonal section with alternate long and short sides. Above this series of mouldings the pilasters have scaled carved decoration on their two broader lateral sides. This decoration is interupted by a collar of mouldings, resembling a simple base on capital, and then continues until terminated by a single moulding surmounted by a carved foliate capital. Above the aprons connecting the pilasters are moulded cross members. The two outside sections between the pilasters are filled by plain vertical stiles enclosing plain framed doors, the frames enclosing two panels above one another, the top one larger. The lower panel is filled with foliate and curved strapwork carving; the top panel with carved perpendicular tracery, incorporating arches, ogees, crowns and a circular rose filled with four quatrefoils. The doors have external hinges of brass at top and bottom, fretted and foliate; they are fixed with brass screws with punched decoration. These are on the outer sides of the door frames and enclosing stiles; on the centre of the inner door frame are brass lock plates with twisted drop handles. The central cupboard has similar hinges but two doors with extra hinges in the centre of the plain stiles. Instead of panels the doors are filled with brass tracery formed by three hexagonal columns, twisted after half their length and then, after a simple capital, extending as scrolled interlaced foliage: between these columns is a network of ogees with cusps supporting leaves, and two fleur de lys at the top. The right hand door has a pilaster applied to its inner stile; this commences as a corbel with foliate carving and then rises from a moulded base as a scale-carved semi-octagonal pilaster. It is broken by a spear shaped capital crocketed on sides and top and with a carved flower on its front, and above this by a simple base and capital; it then rises again as a scale-carved demi-octagonal pilaster. It terminates in another similarly treated spear-shaped capital surmounted by an extended series of foliate crockets. The right hand door has a similar central lock plate and handle to the side doors fixed on a plain stile next to the pilaster. The left hand door is retained by two brass sliding catches at top and bottom. The insides of the doors and cupboards are of panelled construction with chamfered sides. The centre cupboard was originally lined in a red fabric and panels covered with a modern red cotton have been fitted inside the cupboard to replicate the original lining. Above the capitals of the four main pilasters are flat fronted corbels, with chamfered sides incorporating small corbels. These corbels are connected by rails carved as a foliate ribbon twining around a rod. Above this is a cross member with mouldings at the bottom. This is surmounted by a wider cornice member with a carved series of inverted crenellations. Above this cornice is a fretted gallery consisting of a series of roundels of foliate carving surmounted by alternate pine-cone and floral motifs interconnected by a twisted rail. This gallery is broken by shields painted variously with the monogram IC, a pair of compasses with the legend 'I keep within' between them on a formalised flower motif, and an inverted T on a similar floral motif. There are four of these shields on the front of the cabinet. The sides of the cabinet are similarly decorated to the front, with two pilasters enclosing panelling, with linenfold carving. The side aprons however are plain and reach to the ground; there are two shields in each side cresting. Pugin designed this cabinet for display in the Medieval Court at the Great Exhibition of 1851 and it was made by J.G. Crace's firm. His son, J.D. Crace, gave Pugin's designs for constructional and carving details to the Museum (Department of Word and Image, E.1557-1912 to E.1560-1912). Also in the Department's collection is a drawing, partly coloured, by H. Michael (D.1050-1886) of the cabinet which was reproduced in Industrial Arts of the XIX Century, at the Great Exhibition 1851by Matthew Digby Wyatt, 1853. This drawing shows a red lining inside the central compartment of the cabinet. The cabinet was the first piece of Briitsh furniture chosen for the Museum of Manufactures, the ancestor of the Victoria and Albert Museum. The Museum of Manufactures was located in Marlborough House and the cabinet, which cost £154, was praised both for the construction and carved details in Department of Practical Art: A Catalogue of the Articles of Ornamental Art selected from the Exhibition of the Works of Industry of All Nations in 1851 and Purchased by the Government, 1852, page 48. By 1933 official appreciation of the Gothic Revival was at its lowest and Oliver Brackett, then Keeper of the Department of Woodwork, was considering the disposal of the cabinet. Saved by its use as an office bookcase at the Bethnal Green Museum, the cabinet's importance was acknowledged when it was included in a major early exhibition of Victorian and Edwardian Decorative Arts held at the Victoria and Albert Museum in 1952. Historical significance: This cabinet was the first piece of furniture chosen for the Museum of Manufactures, the ancestor of the Victoria and Albert Museum. It was designed in 1850 for the Medieval Court of the Great Exhibition by A.W.N. Pugin, a prolific architect and designer and the most influential figure of the Gothic Revival. The Medieval Court was highly influential and this cabinet was described in the Art Journal Illustrated Catalogue as 'one of the most important pices in the Mediaeval Court'. 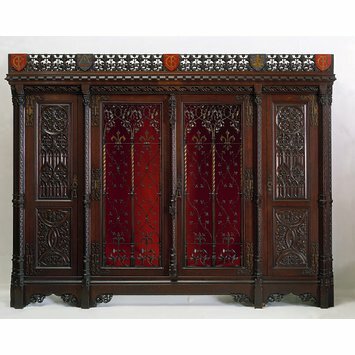 The armoire was based upon the most elaborate examples of Medieval carved furniture and is a good example of Pugin's expert knowledge of Gothic form and detail. It is also a good example of Pugin's use of decoration to emphasise, rather than conceal, the construction of his furniture. Wilk, Christopher ed. Western Furniture: 1350 to the Present Day in the Victoria & Albert Museum. London: Philip Wilson in association with the Victoria and Albert Museum, 1996. pp.150-1.